The purpose of this identification section is to introduce everyone to the more commonly encountered microfossils in the Gault Clay, as they seem rather overlooked. This section focuses on the echinoderms found commonly in sievings from the Gault. I'm currently working on the foraminifera, these should be on the MID soon as well. Description: Cup up to 2mm in diameter, with five bulbous, glassy lobes on the lower half. The top half looks hollow when viewed from the top. Often fragile and fragmented in preservation. Age: Middle Albian, Lower Gault Clay, restricted to Bed III at Folkestone. Remarks: Fragments, thin and glassy, are extremely common in sievings. References: Fossils of the Gault Clay, 2010, the Palaeontological Association. Description: Lateral arm plates are blocky and finely textured with an ornament of fine pits and tubercules. The outer face is gently curved. Usually about 1mm squared. 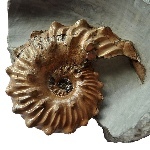 Age: Common throughout the Gault Clay, commonly found in sievings.